Get EarthVoice Podcast on Air! EarthVoice isn’t your average podcast – this is a unique audio storytelling project that will explore the role activism plays in the modern environmental movement by taking listeners onto the frontlines of some of the most cutting-edge environmental and animal rights campaigns. EarthVoice will combine creative storytelling techniques, innovative sound design, and investigative journalism to produce ten 30-minute radio documentaries (each to be divided into three 10-minute segments) that will be published on The Ecologist website, and also be freely available via Soundcloud, iTunes, and the EarthVoice website. We have some exciting subjects lined up so far, including the Black Mamba Anti-Poaching unit in South Africa, Wolf Patrol in the United States, and the Jane Goodall Institute's global Roots & Shoots program. We believe in the power of good stories to spread awareness, start important conversations, and create change. EarthVoice Podcast can help generate this change by taking listeners on incredible journeys with passionate activists working on crucial environmental and animal rights issues. We decided to make a podcast because we know how busy our everyday lives can get. But you can listen to a podcast while you’re driving, cooking, or taking a walk. Podcasts are also easy to share with others! Can you please help get EarthVoice get on air by donating? Every donation will count, so please consider helping, even if you can only contribute in a small way. When you donate to EarthVoice, we have some amazing perks you can choose from. For $25, we’ll send you and someone else an EarthVoice Christmas card. For $75, you can style is up with an EarthVoice T-shirt. We also have a limited edition EarthVoice CD available, and different sponsorship and advertising packages. 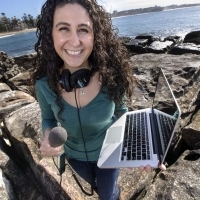 Elizabeth Claire Alberts, the creator of EarthVoice Podcast, has a PhD in creative writing, and has spent the last six years lecturing and teaching creative writing at Macquarie University. But in January 2016, she’s quitting her job to work on EarthVoice full-time. Elizabeth has previously worked as a freelance environmental journalist, writing for publications like Alternatives Journal, Audubon, The Ecologist, Earth Island Journal, Great Ocean Quarterly, Resurgence, and Wild. In 2015, Elizabeth took an audio storytelling class with NPR reporter Rhonda Miller, and this helped hatch her plan to launch EarthVoice Podcast. Elizabeth is excited to (finally!) use the performance skills she gained when working on her BA in Theatre at the College of Wooster. She is also a passionate animal lover, and has volunteered for various organizations including Sea Shepherd Conservation Society and the Two Hands Project. Sonia M. Avendaño, the Marketing & Outreach Coordinator of EarthVoice Podcast, is a graduate from the University of Illinois at Urbana-Champaign with a B.S. in Advertising. Sonia built the foundation of her career working at large advertising agencies in Chicago, she loved the creative energy of the industry, but never truly felt connected to the corporate world. In the summer of 2015, she left her corporate position in advertising to pursue work within the nonprofit sector.Sonia is very excited to be a part of this great adventure with Elizabeth and EarthVoice Podcast. This is the perfect opportunity for her to tie her passions with her work! David Nolan, EarthVoice's Intern, is a writer interested in all genres. He studied writing at Macquarie University, and he's currently working on a number of different projects, including several novels in the genres of sci-fi, fantasy and political drama, as well as a couple of podcasts with friends, "Meanwhile in the Legion of Doom" and "Internet Drop Outs." He's very excited to be working with EarthVoice Podcast, and this is his first internship. Help EarthVoice Podcast give a voice to those who help animals and the environment! By donating $50, we'll thank you personally on EarthVoice's website on a special page dedicated to our supporters. Want to sponsor an EarthVoice episode? For $1,000, we'll thank you on air for sponsoring a specific episode. (Each episode will be divided into three segments, so you'll be mentioned three times!) *Please email [email protected] for more details. * $70 in offline donations included in total. Get in touch with Get EarthVoice Podcast on Air!